Poem Fragment 1795 by Robbie Burns"Will ye go to the Hielands, Leezie Lindsay,Will ye go to the Hielands wi' me?Will ye go to the Hielands, Leezie Lindsay,My pride and my darling to be." to Toronto, Canada in 1922. Dinner was catered by Sister's Restaurant in Scarborough, featuring a Roast Beef dinner, a Vegetarian Choice and a cash bar. Nearly 50 people attended from Guelph, Regina, Midland, Belleville, Ajax, Burlington, Oakville, Toronto, Idaho and Nicaragua. 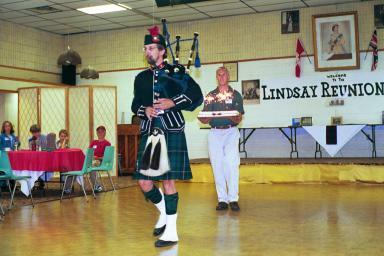 A BIG THANK YOU to everyone who participated in the Lindsay Family Reunion 1999. 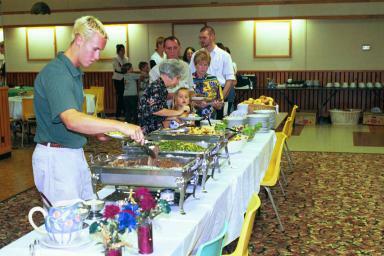 I'm delighted you were able to make it and that the response to the idea of a family reunion was received so warmly. There comes a time in the evolution of every family when the normal needs of every day living move family members further and further apart. Once close relationships, indeed friendships, are kept alive only through chance gatherings at weddings, christenings and funerals. Hopefully, today provided a rare opportunity to catch up on the events that have taken place in each other's lives over the past few years; to meet new members of the family not born last time we met; to greet new in-laws wise enough to fall in love with a Lindsay; to remember those we've lost; to rekindle old friendships and just have a great time--together. The day would not have been possible without the help of a number of people: the hall was a gift of Stuart's husband Clint Prouse; the banner was a creation of Steven Crawford; Kathy Kosciejew helped out greatly on the day; the Lindsay Family Trees and Charts posted on the walls were created by Alan Appleby; the family portrait from 1898 on the cover of the Handout is the property of Betty (Bell) Schroeder and the photos were taken and developed by Jeff Kosciejew.. Door Prizes were awarded to Matthew Appleby for agreeing to carry the cake (Lindsay tie), Alan Appleby for his work on the family tree charts and helping decorate the room (Lindsay Crest key chain),Betty Murphy for bringing the most family photos (Lindsay tartan change purse), Heather Fraser and Jeremy Gray for winning Steve's Name Game (book on Lindsay History), Danny Tie for coming the furthest distance (Lindsay key chain) , Steven Lindsay for making the most money by selling Pokemon cards (Lindsay bookmark) and Judy Spenser for being the first to arrive and for all her help on the day (a Lindsay crest shot glass). It was geat seeing everyone and I hope you all had fun!